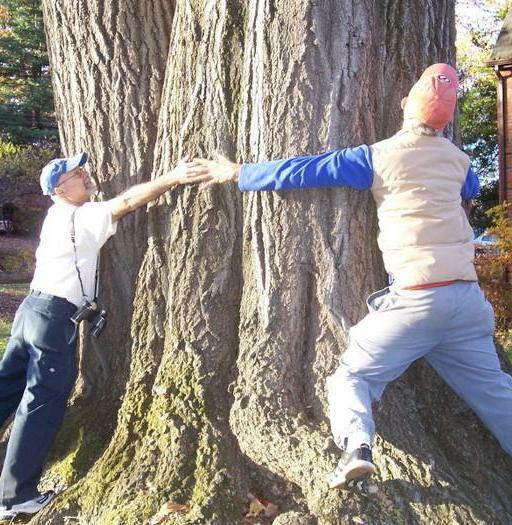 It took five people to encircle his northern red oak during a previous tree tour, including local ornithologist Dave Blockstein (left) and FOSC past-president Jim Baird. Join tree champion and Sligo resident Joe Howard on Saturday, October 20, for a bicycle tour of the watershed's biggest trees, some of them county champions. The ride begins at 9:20 am at the Schweinhaut Senior Center, 1000 Forest Glen Road (just east of Sligo Creek Parkway) with an orientation followed by departure at 9:30. The tour will visit 18 trees and cover about ten miles, returning to the senior center around 12:30. Joe is a member of the Montgomery County Forestry Board and founder of the champion trees registry for Montgomery County. He can fairly be called Sligo's preeminent champion of champion trees. A highlight of the itinerary is the newly-documented biggest tree in the Sligo watershed: a native Willow Oak with a massive circumference of 18 feet. 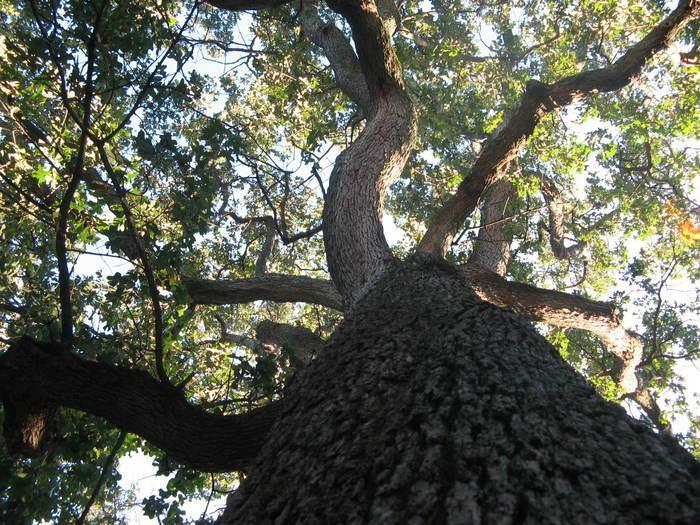 We'll also meet a new champion Loblolly Pine (a species native just east of Sligo), a rare native Umbrella Magnolia, and a newly documented Southern Red Oak with a fifteen-foot circumference. In addition, bikers can pay their respects to some old champions like our Yellow Buckeye, Shingle Oak, and Yellowwood. If you're running late, catch up at the the first tree: a white pine near the building to the right of the center. The second stop is in a wooded area, but the third and fourth trees are easily found at 1400 Dennis Ave and 1715 Dublin Drive. For questions, contact the event organizer at his email here: Pat Ratkowski. 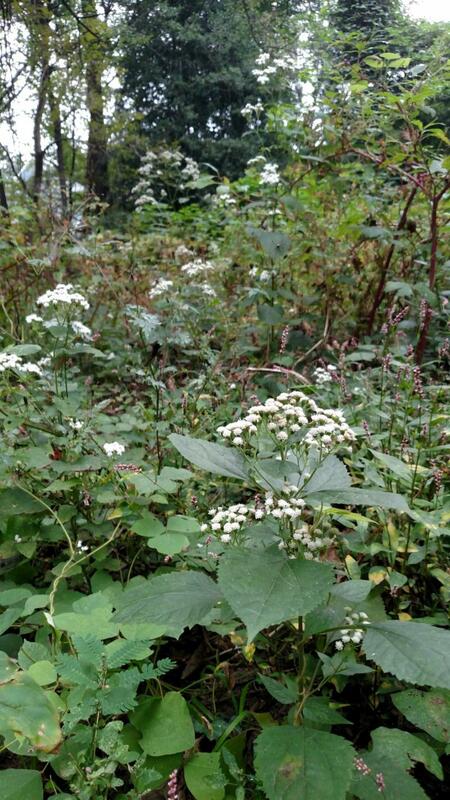 Join other volunteers in planting shrubs and perennials on a 200-foot-long median strip adjoining Sligo Creek Park in the Carole Highlands neighborhood on Sunday, October 21, from 10 am to 1 pm. The garden project is located between the north edge of the Park and the intersection of Drexel Street and 15th Avenue in Hyattsville. 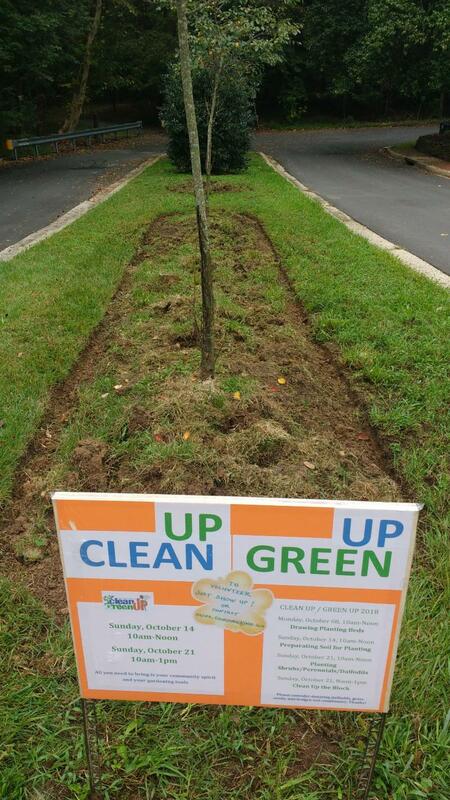 This planting is part of the Prince George's County "Clean Up Green Up" program. The county will provide work gloves, shovels, trowels, trash bags, and safety vests, along with drinking water and snacks. It would be helpful, however, if you can bring your own tools. Our thanks to Carlo Sanchez, Maryland House Delegate (District 47B), for sponsoring this community beautification initiative. Gratitude also to Wayne Lucas, landscape architect wit the county's Department of Public Works and Transportation for investigating the ownership of the median section and to gain approval for this planting from the county. Learn about the top predator in Sligo's waters, the American eel, when aquatic biologist Matthew Rinehimer, of the Maryland Department of Natural Resources, speaks on Wednesday, November 14, at the Sligo-Dennis Avenue Local Park. The talk begins at 7:30. Come at 7:15 for refreshments and to meet other enthusiasts for nature in Sligo Creek. The building is located on the west side of Sligo Creek Parkway just north (upstream) from Dennis Avenue and next to the basketball courts. 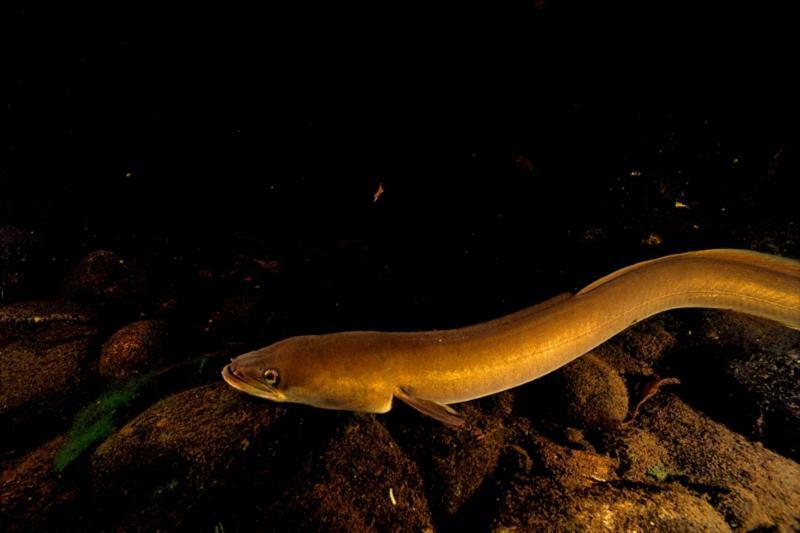 Even though eels were the third most abundant fish found in a survey of Sligo by the county last summer, they are rarely seen by humans since they are mostly nighttime hunters. Matthew Rinehimer is a biologist with the Maryland Department of Natural Resources and is based in Stevensville. He joined the DNR in 2007 after graduating from McDaniel College and has worked since on monitoring eel, yellow perch, white perch, and catfish. 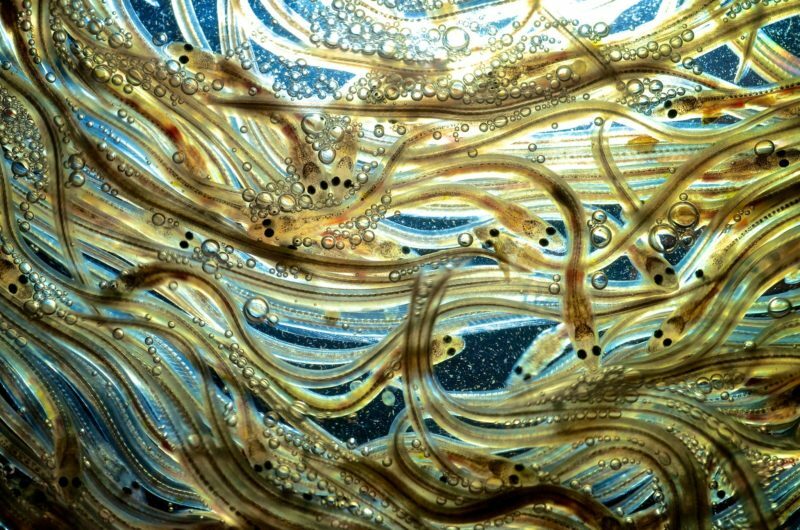 His talk will cover eel biology and its life stages from birth in the Sargasso Sea (in the middle of the Atlantic Ocean) to migration to our waters, their seasons in our fresh and brackish waters, and their return to oceanic spawning grounds. He will also discuss trends in their statewide abundance, their role in our ecosystems, Maryland's commercial eel fishery, DNR's data population monitoring, threats to the eels, and a variety of interesting fun facts about these fascinating aquatic animals. 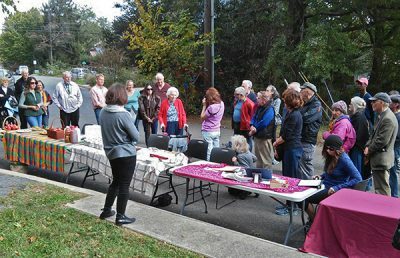 A multi-year saga to preserve "Dorothy's Woods" in Takoma Park finally reached a happy conclusion on September 12 when the city arrived at an agreement with the mortgage holder of the original property to prevent its sale at an unexpected second auction and preserve the city's control of the property. While the city appeared to have purchased the land at auction in 2015, it was learned that the larger McLaughlin School property (that included the Woods) retained several "encumbrances." One of these was the original mortgage lien on the overall school lot, which was sold to an outside mortgage company. In September, just before the new auction date, the mortgage company and the city agreed on a price of $250,000 for release of the lien and dismissal of its foreclosure action against the city. About $100,000 of this payment came from personal donations by neighbors and others dedicated to preserving the woodland. The 2.68 acre site -- a mix of mature and understory trees and open areas -- is located along the west side of Woodland Avenue, just northwest of the intersection with Circle Avenue. For the last three years many volunteers (including neighbors and FOSC members) have spent time removing trash and invasive vines from the woodland. The City Council chose to make this further commitment to the land "based on its recognition of the importance of the environmental and climate benefits of the parcel." Among the considerable variety of canopy and understory trees are sycamore, American beech, American elm, tulip-tree, northern red oak, southern red oak, white oak, willow oak, red maple, box elder, American holly, sweet gum, and black gum. For a blow-by-blow chronology of the complex legal and financial maneuverings, and the dogged research by dedicated city lawyers, see the city's web page on this project. Celebrate the Year of the Anacostia at the Third Festival del Rio Anacostia on Saturday, October 13, from 11 am to 4 pm. 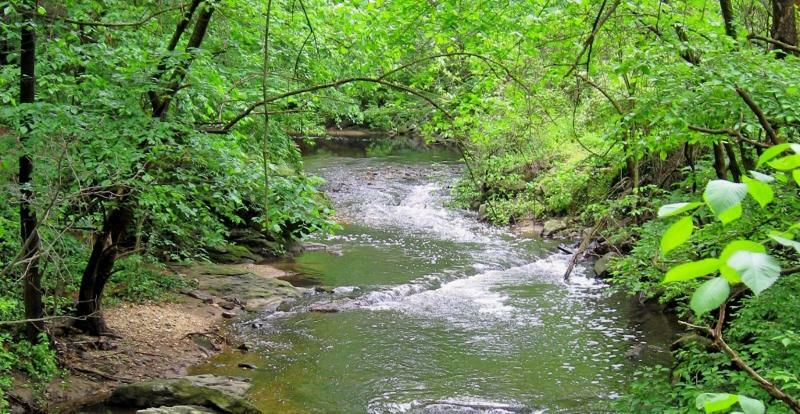 Advocacy groups for tributaries of the Anacostia will be represented, including Sligo Creek. All events take place at Bladensburg Waterfront Park (4601 Annapolis Road), where you can enjoy boat rides, fishing, displays of live birds and fish, nature walks, arts and crafts, and more. Along with live performances and ethnic foods, there will be workshops to learn about the Anacostia River and its tributaries, drinking water, and conservation gardens. You can also help Friends of Sligo Creek by joining board members Delia Aguilar and Kit Gage at our information table: contact advocacy@fosc.org to volunteer. 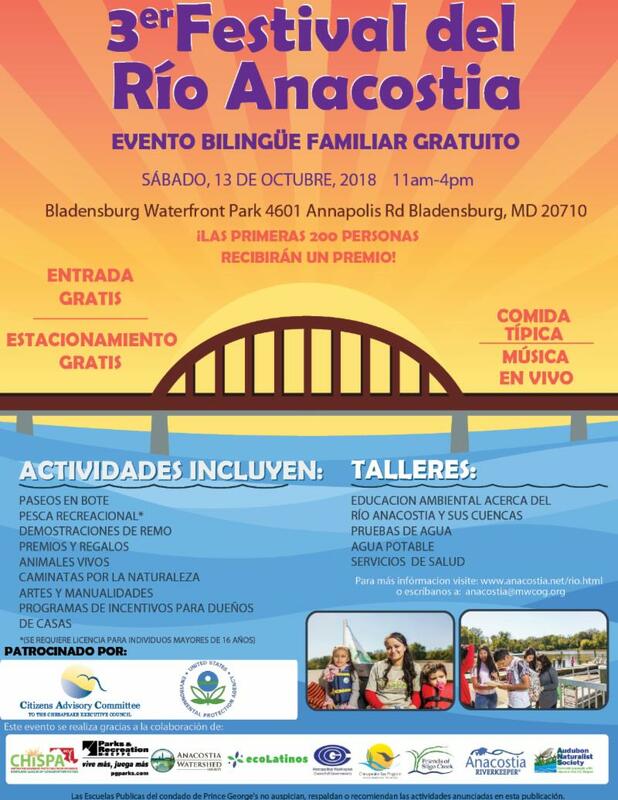 The free bilingual and family-friendly event connects Latino residents with the Anacostia River and the groups working to encourage environmental education and outreach about our watershed. For more information, visit the festival's website. 2018 was declared the Year of the Anacostia by the DC City Council and the Prince George's County Council to honor the river's history, celebrate recent restoration progress, and enjoy the river and its surroundings. It's also the 100th anniversary of Anacostia Park, created by the National Park Service. Earlier this year the massive Anacostia River Tunnel was completed by DC Water (the city's water utility). It is expected to reduce pollution from "combined sewer overflows" (which can occur doing heavy rain) into the river by 81 percent. The 23-foot diameter tunnel runs from RFK Stadium to Poplar Point in DC. For more information, contact Kit Gage here: advocacy@fosc.org. Friends of Sligo Creek is a nonprofit community organization dedicated to protecting, improving, and appreciating the ecological health of Sligo Creek Park and its surrounding watershed.